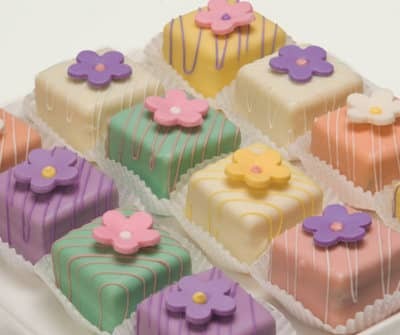 Our Delicious petits fours cakes, with a variety of refreshing fruit and chocolate fillings, a Springtime must have for all of your gatherings! A luscious garden of ornamental delights to behold and devour. Each cake is gracefully enrobed in a pallet of soft pastels and is trimmed with a fully blooming chocolate flower for a fun and whimsical look. Varieties featured are an assortment of refreshing fruit and chocolate fillings: Raspberry Creme, Lime, Pineapple, Banana, Coconut, Chocolate Orange and Bittersweet Truffle.